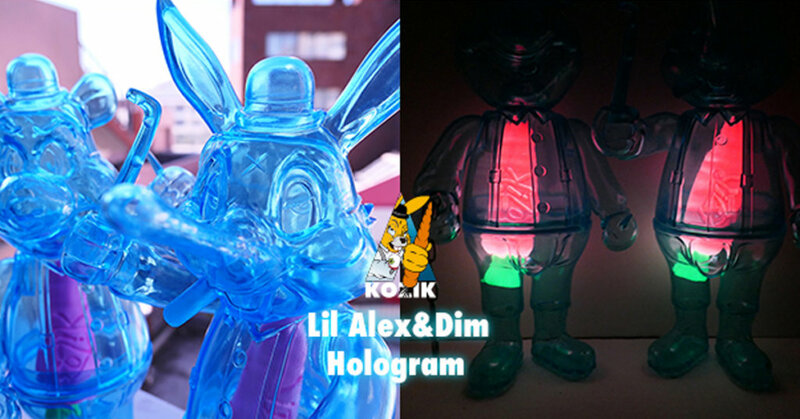 Lil Alex & Dim Hologram by Frank Kozik x Blackbook Toy! We can destroy what we have written, but we cannot unwrite it. The Clockwork Carrot duo – Lil Alex & Dim Hologram by Frank Kozik x Blackbook Toy released yesterday and if you’re still luck you may be able to snag yourself Lil Dim! (Lil Alex sold out). Lil Dim is the fella on the bottom of this image! Made in sofubi, this Lil Alex & Dim are made in beautiful clear blue cast. Each figure comes with a carrot, which is GID!! These figures are sold individually, rather than a set. the GID carrot is cast in resin one by one by Chop of Monster Farm. Whilst Lil Alex has sold out, Lil Dim is available for 10,800YEN (£76/$98). Standing at 11inches tall, Lil Dim can be purchased HERE from the Blackbook Toy online store. Each figure comes with Lil Alex metal charm, which you can wear on Lil Alex & Dim as a necklace or you can use as a key holder!